Intercambios de inglés gratis en Granada: ¿Cuál es tu excusa para no practicar fuera del aula? Actualizado 09.04.19. ¿Estás estudiando el B1, B2 or C1, o vas a estudiar inglés o trabajar en Inglaterra, Irlanda o Malta? Entonces, una de las mejores formas de desarrollar tus habilidades de “speaking & listening” es asistiendo en los intercambios de inglés gratis en Granada. Además, puedes conocer a nuevas personas. Sobre todo, la misión de Inglés Ya es ayudarte a aprender inglés de la mejor manera. Por eso, nuestra lista de “intercambios de inglés gratis” está inscrito en inglés. * Por favor, comparta esta lista pero no darlo como es tu propio trabajo. Al menos dar algunas gracias a www.inglesya.com. Now in it’s 4th year, this very popular intercambio has changed to Tuesdays. It draws a mixed age group with between 20 and 30+ attendees. A well organised event in a great bar with plenty of space and quiet music that encourages relaxed conversation. Please arrive early to guarantee a seat! Granada’s most established intercambio, drawing a mixed age group with around 20 attendees every week. Many regulars but new attendees are always welcomed. Facebook page “Totes Intercambio De Idiomas Granada.” Castellano and English. Facilitator: Totes. Join the Couchsurfing network to access event information. A good mix of languages attracting mainly younger people who love to travel. Organised by an English academy. No more information to add at the moment. Watch this space! Facilitator: Corrine. A stylish new and spacious location for an established intercambio, (formerly held in el Pilar de Toro). This too is a well organised and suits all ages. Around 30 people regularly attend this event. There is a nice mix of ages, so it is ideal for anyone who is worried about age groups. I joined in on 19.10.18 and chatted to people in their early 20s, mid 30s and late 40s! It has a nice atmosphere and the facilitators are always around to guide you and stimulate conversations (if necessary). Over half the group are regular attendees. Facebook. Facilitator: Sofía (o Rocio). A new location for an established Couchsurfing Meet Up.very informal and open to all languages though Spanish and English is most practised. At the moment between 15 – 30 people attend most weeks. 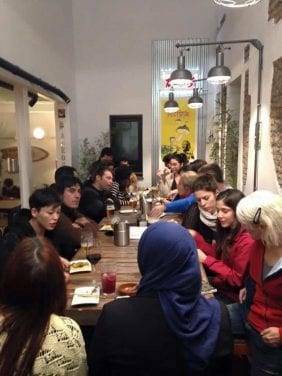 Organised by Geokeda: An informal meet up in this lively bar in the centre of town that attracts up to 30 attendees. No longer a weekly event. This event is every 2 weeks. Castellano and English. The second weekly informal meet organised at La Goma: up with 15- 20 attendees. Mainly Castellano and English are spoken but all languages are encouraged. Facebook. Facilitator: Paula. Furthermore, there is an increasingly popular intercambio that charges a small fee of 2€. “Tic Talk” is a dynamic, well organised event. Now in it’s second year, it has grown to 2 or 3 events per week. You must sign up in advance using the Tic Talk WhatsApp number 677 158 941 because the event is planned with a limit on the number of participants. You can also buy a Tic Talk card for 15€, providing discounts to over 40 establishments in Granada (bars, travel agents, a gym etc). Moreover, the card discounts the intercambio to 1€. Please consult the Facebook for dates, places and other details. Facilitator: Juan de Valverde.